Hannah Johnson of the Toy Hearts (UK) reports for the next issue of Bluegrass Europe on events in the UK during June and July, including tours by the Wilders and Crooked Still (USA). 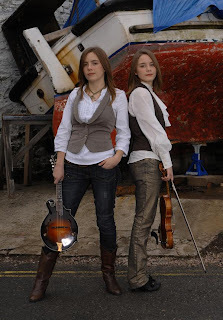 Hannah's report also features the Carrivick Sisters (UK), who appeared at the EWOB Festival in 2007, and have built a strong reputation with their multi-instrumental skills, original material, and duet singing. Their summer appearances in Britain include the Gower and Crawley Folk Festivals, and an autumn tour in Ireland is under consideration. To hear Charlotte (vocals, guitar, mandolin, clawhammer banjo) and Laura Carrivick (vocals, dobro, fiddle, cello, guitar), and for more information, visit their MySpace and SonicBids sites. Their brand new album Jupiter's corner is available now.